Legendary sports broadcaster Craig Sager died today after a two-year battle with leukemia. He was 65. Over the course of his 40-plus year career, Sager established a reputation as a go-to sideline reporter, beloved by fans, players, and coaches for his professionalism, affability, and love of the game. He was also, of course, known for his suits, full of boldly envisioned color pairings and flamboyant flourishes. Any given Thursday Sager might appear in a billowing pink suit or a paisley blazer; on Christmas, he might ratchet it up with a snowman plushy dangling where a tie normally would. The suits were corny, but part of Sager’s appeal was as a consummate broadcaster—he took the ribbings from the studio crew and coaches with characteristic good humor, always countering with another clean, insightful question. 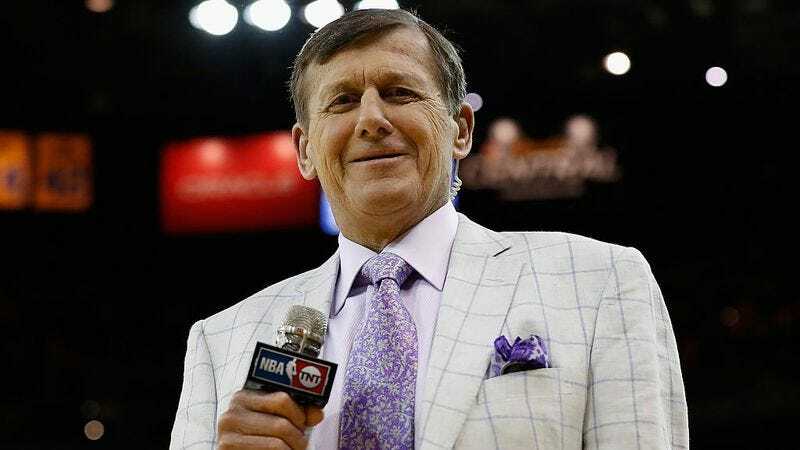 While best known for his work during TNT’s long-running deal with the NBA, Sager also provided coverage for CNN, TNT, TBS, and CBS throughout his career, on sports including baseball, football, golf, tennis, curling, skiing, and more. This year, he was loaned to ESPN to cover the NBA Finals—the first in his storied career, thanks to weird NBA broadcasting rules—a fact which lead that series’ MVP, Lebron James, to pause an interview and exclaim, “How in the hell did you go 30-plus years without getting a Finals game?” And in July, Sager was awarded the Jimmy V Perseverance award at the ESPY Awards by Vice President Joe Biden, after which he gave a moving speech embracing life and expressing an ultimate optimism in the fight against cancer. I have run with the bulls in Pamplona. I have raced with Mario Andretti in Indianapolis. I have climbed the Great Wall of China. I have jumped out of airplanes over Kansas. I have wrestled gators in Florida. I have sailed the ocean with Ted Turner. I have swam the oceans and the Caribbean. And I have interviewed Gregg Popovich—mid-game, Spurs down 7. If I’ve learned anything through all this, it’s that each and every day is a canvas waiting to be painted. Man, life is too beautiful, too wonderful, there’s just too many things. It’s not just you. It’s your family and kids and all. Fight. Fight until the end. Fight as hard as you can. Twitter is full of athletes and figures from throughout the sports media world commemorating Sager’s life. He is survived by his wife, Stacy, and five children.